Green beans coated with toasted onion breading. Served with ranch dressing. Cheese Curds - The Wisconsin favorite! Golden brown chunks of real Wisconsin cheddar cheese curds. A great way to start your meal! Real jalapeno pepper halves stuffed with your choice of cheddar or cream cheese. Olé! Curly fries and onion rings basket. Sized just right! 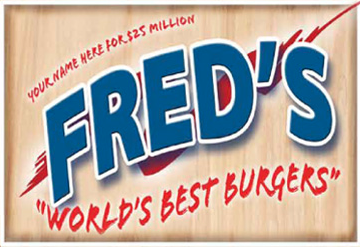 Fred’s burgers are hand pattied, sprinkled with Fred’s special seasoning, topped with lettuce, tomato, onion, and pickles served on your choice of a fresh white or wheat bun. Hamburgers are cooked medium unless otherwise specified. A real classic! Our burger is as good as it gets. Topped with creamy horseradish sauce. This burger packs quite a kick! An original Fred's favorite. We top our fresh ground beef patty with grilled ham, sautéed onions, green peppers and melted Swiss cheese. It will be your favorite too! The Classic doubled. This is for the serious appetite. A full pound of Fred's fresh ground beef. Good Luck! Fred’s potatoes are all made to order using only fresh raw Idaho potatoes. No wimpy frozen fries are allowed through Fred’s doors! French fries cut from sweet potatoes. Not just for the holidays! Slow roasted, tender and juicy. This will remind you of Mom's pot roast! Tender grilled ham & Swiss cheese on top of our grilled chicken add the finishing touches to this flavorful Fred's favorite! You asked for this one and Fred's delivers! Our grilled chicken breast loaded with sliced mushrooms and melted Swiss cheese, you'll love it! How about a soft drink? We feature nine ice cold tap beers and Sprecher’s Original tap root beer. All kid’s meals include fries, chips or apple sauce and choice of soft drink, apple juice, white or chocolate milk. No refills on Sprecher’s Root Beer. Look Great When You Leave! Ask about our great selection of Fred’s Wear. Don't forget, Fred's gift certificates make great gifts.